If you click on the "submit news" link on the left, your Email software should open and you can post directly to this site. The subject line in the Email will be the subject line here and the content of your Email will be the content here. Use this responsibly with care - I will see how it works and then decide to keep it this way or not. And by the way.... I don't need 200 "TEST" posts on here by tonight :). That stuff works! Gene's Machine has a new website out! I have been hard at work on the new tractor pulling game for some time. There are now 28 tractors, there are 30+ levels. There are different tracks, better air/weight adjustment interfaces and better graphics. 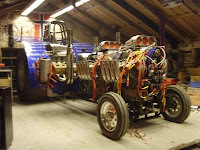 The norwegian 2,5 mod "Final Countdown" Team sold their tractor to Holland and bought the Breaker from Karl Sofus Engen. They will keep the name and pull it in the 2.5 ton mod class. I have been thinking for a while, whether I should write something about this or not, but this boy deserves it. I wish it would be for another reason though. I didn't know Jan too well, but of course I have followed the sad story about him, the illness and his enormous fight against cancer, making it from day to day, trying to realize his dream of running a Pro Stock tractor. The Schokkin family has been active in the dutch Hot Farm circuit for a long time and was trying to move it's way up into a bigger class, driven by the wish of Jan, to once compete with a Pro Stock tractor. By the age of 21 Jan got the horrible news, that changed everything: Cancer and only a few days left to live. From that point on, Jan and his family fought an enormous battle against time, trying to make the wish come true in the little time that was left. Together they've managed to get Jan on the "big track" at Lochem with a John Deere Diesel Super Stock, called "Dark Side of the Moon", and it was a moment creating goose bumps for everyone in the crowd, when Jan, knowing this might very well be an "one and only" occasion for him, went down the track in front of 10.000 spectators and was pulled back into the pits in front of the grandstands, his face covered with oil sprinkles and as exited as you can get, hoping for more in the future. But for him there sadly was no future. In the evening of the 24th of November, Jan Shokkin died by the age of 24 in the hospital of Nijmegen. Jan, we're proud of you! You'll be remembered as a true Tractor Puller with a big heart who showed us all, that personal effort can maybe not always get you wherever you want to, but a big step foward in the desired direction. New on RTL 7 - the third part! Wllie van Dommelen, still on the track with his camera after 30 years, is sharing his collection of videos and fotos. 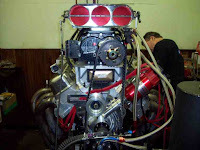 Probably the best collection of European Tractor Pulling History is about to enfold on the White Horse team's website. Check www.whitehorse.nl! For the videos go to their "archief". The second part of the RTL 7 NTTO Tractor Pulling coverage is online! Check their online program review! Many diesel teams have used the help of Lindemann Dieseltechnik in the past. The involvement in the Tractor Pulling sport through his buisiness has now had it's addictive influence on company owner Andreas Lindemann. After "playing" with a IHC 1246 at local brush pulls in the last two years and also taking part in the 2008 german championships for Sportklasse tractors, he is now building something a little more serious. A IHC 1455 (DT 402 german diesel with ZF transmission) is currently getting prepared to enter the north german tracks in 2009. The german Hot and Farm Pullers had a meeting last sunday and have changed a substantial part of the rulebook. After the request from the ETPC T&S board to make sure anything over 500 hp is 100 % build to the Pro Stock safety sules, the decision was made to stay exactly below those 500 hp. To insure the power limit an Air Restrictor of 68mm diameter over 20mm for tractors with more than 68mm Turbo inlet was introduced to the rules. Another request of the T&S people was a "serious" ROP. 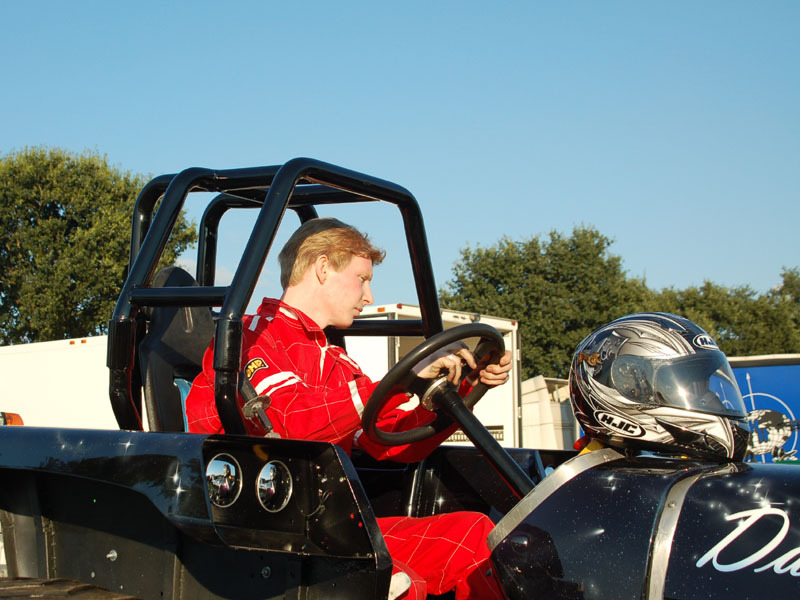 With help of the Trecker Treck Team Sonsbeck a calculated ROP was designed and will now also enter the rules for 2008. For Hot Farm (Sportklasse, Super Sportklasse) from other countries this means, they can only pull in Germany using a smaller than 68mm Turbo or the air restrictor and have either a "Street legal" ROP, ETPC Rollcage or a homemade construction according to the DTTO rulebook. Anything else will be considered a "Pro Stock" and teched by those specs and rules until clear guidelines for any classes in between are coming from the ETPC. The new rulebook for 2009 will be confirmed at the next DTTO Board meeting and will be ready for download at www.tractorpulling.de by the end of december. From now on, you can see the video of the dyno test of our engine on our site. We have started building a new tractor, you can find pictures on our home page if you want them on the pullingworld, under "Winter 2008"
Aussie blokes may grow old but they don’t always grow up . . . in fact, often the only difference between men and boys is the size of their toys! ► Meet ‘Jobbo’ and his champion tractor ‘Outlaw Too’. Jobbo hails from Quambatook, the tractor-pulling capital of Australia. With three chunky V8 Chevy engines, giant tyres and a maze of exhaust pipes and extractors, ‘Outlaw Too’ looks like a mobile oil refinery. ◄ Then there’s Andrew and Eddie, from Mullumbimby, who’ve built their own flying tricycle. ► And Bruce, from Cowra, who has restored a Centurion tank in his farm shed. In the new book Big Boys’ Toys, these blokes and many more come together to stand up for what’s big and noisy and leaking oil everywhere. Tug boats, paddle steamers, top-fuellers, UFOs, truck buggies, a lighthouse: you name it, there’s a bloke out there fixing it, or painting it, tuning it up or replacing the brake pads – again! Big Boys’ Toys has been a labour of love for author and train buff Scott McGregor, who has scoured sheds, hangers and waterways all round Australia in search of the grandest, the noisiest and, in some cases, the strangest backyard obsessions. 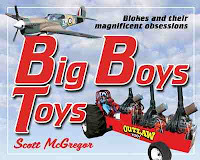 With a foreword by Warren Brown, and packed with photos and vital statistics, Big Boys’ Toys lifts the dust sheet and scrapes back the paint to uncover the who’s, the hows and, most mysteriously, the whys, of oversized boys and their supersized toys. Actor and well-known television personality Scott McGregor has a passion for trains. Scott is the proud owner of a 1:1 scale train set on his property near Mudgee, Ruwenzori. Visit his website to see more: www.ruwenzori.com.au. Come join the Sunday Pull Chat! Willem Veldhuizen has a lot of parts for sale in our classifieds section. From rearends to hoods, from oil pan to Alky heads. Do we have to expect something new out of the Bits'n Pieces team? Bryce van Genderen got his buisiness online, check out http://www.vgtirecutting.com. 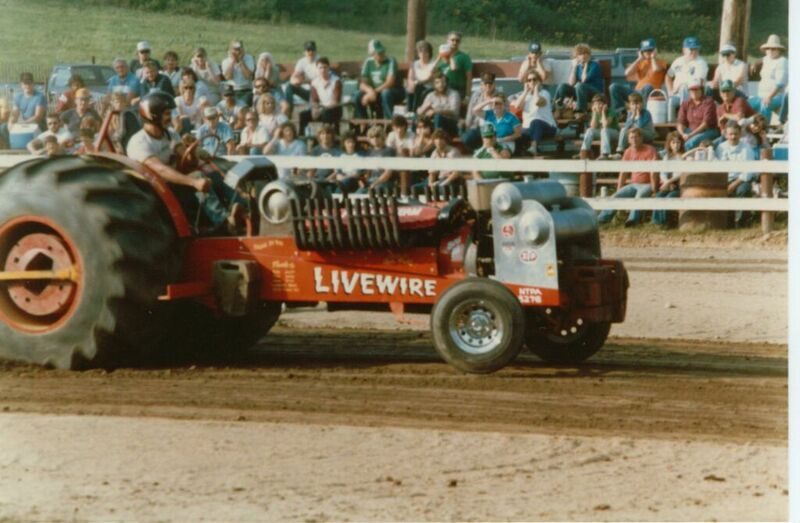 The Awesome Ride guys have put up a very neat gallery of Tractor Pulling pics from the 70s and 80s. In an online voting about the most spectacular events in north germany of the north german TV channel "NDR", Tractor Pulling made it into the second spot and thus got a little TV coverage. I know a lot of you people voted via this website and thus here is the reward, the TV report about tractor pulling in north germany, showing runs from Edewecht of the DTTO and some brush pulling from Lengerich. On Saturday 7 March 2009, the Ahoy complex in Rotterdam will again host the European Indoor Tractor Pulling Championship. The 31st Superpull promises to be another spectacular event, combining plenty of horsepower with pure entertainment. In addition to teams from at least seven countries, the competition will include a star attraction from the Unites States: Show No Mercy. Owner Bruce Slagh has already indicated that he looks forward to raising the roof in what will prove to be a clash of the titans. With 11,000 horsepower on tap, he may just succeed! In addition to hair-raising competitions, visitors will be treated to a spectacular programme, including fireworks, laser shows, DJs and special demonstration trucks. All seats provide a first-class view of the action. As was the case in previous years, the participating machines will be on display in the adjacent exhibition hall for a close-up inspection. There will also be an entertainment programme. Pulling sessions are scheduled for noon and 7 p.m. on Saturday 7 March. Tickets are available from the Ahoy box office on 0900 235 24 69 (€ 0.45/min.) or from Ticketservice on 0900 300 12 50 (€ 0.45/min. ); www.ticketservice.nl. I have just moved into my new appartement in Harsewinkel and got the computer back to work and online. It's been a loooong time since I had a place I could call home. After fininishing my welding school in March, I was working for Hörstkamp all April and then some, being on the road for pulling a lot, started a new job 200 km away from home in Salzgitter (near Hannover), where I stayed in a little single room in a "guesthouse" during the week and at my parents on the weekends. Then got a call from Claas, as they wanted me to come working for them again, which I started to do two weeks ago. After having already given up my appartement in Bielefeld, I had to stay at a friend (with my furniture all packed in one room), sleeping on the couch for two weeks, while waiting for this place to become avaliable. Today I moved in and while it's still a lot of boxes to be unpacked and a bunch of furniture that needs to be bought, I can now call this place home! The most funny thing is: In the past I have been to this house regulary, as a good friend of mine was living here and we had a big room under the roof with a little pulling track for our Lego Pullers. About 20 ft from where I sit right now, I became German Lego Pulling champion in the 450g and 550g class pretty much exactly 20 years ago. Anyhow: I am now welding combine parts for Claas, am close to the workshop of the Green Monster Team again (we went out with several guys and gals of the team tonight) and am back where I grew up.